In our Intranet. we have a site (https://site1) configured with SSL using a generated certificate for a different site URL (https://site2). Chrome/FF/IE/Edge browsers are showing invalid certificate error messages. How do I get these browsers to trust my site's SSL certificate and ignore the error in the future? I tried adding the site certificate to Windows Trusted Root Certificate store, is that the right place? Just to be clear, are you adding the self-signing CA root cert you will be using to sign other certs with? That's what needs to go in the "Trusted CA" store. The self-signed "leaf" cert you want the browser to trust doesn't go there. "Trusted Root CAs" that you have highlighted is where to put the public key of the Certificate Authority (e.g. LetsEncrypt, Verisign, your in-house signing CA being used...) If you are going to be your own CA and sign your own certs, and want your system to trust those, you need to put your CA public key there. From your description though, it sounds like you got a site cert signed by some existing CA, and you want your browsers to trust it. In that case, you are putting it in the wrong place. You want either "Personal" or "Trusted publishers" but that's still just for the OS to trust it. As @Steffen Ullrich commented above, you will also need to add your self-signing CA's public key to the browsers trustStore to do what you probably want. Not the answer you're looking for? Browse other questions tagged tls certificates chrome firefox or ask your own question. 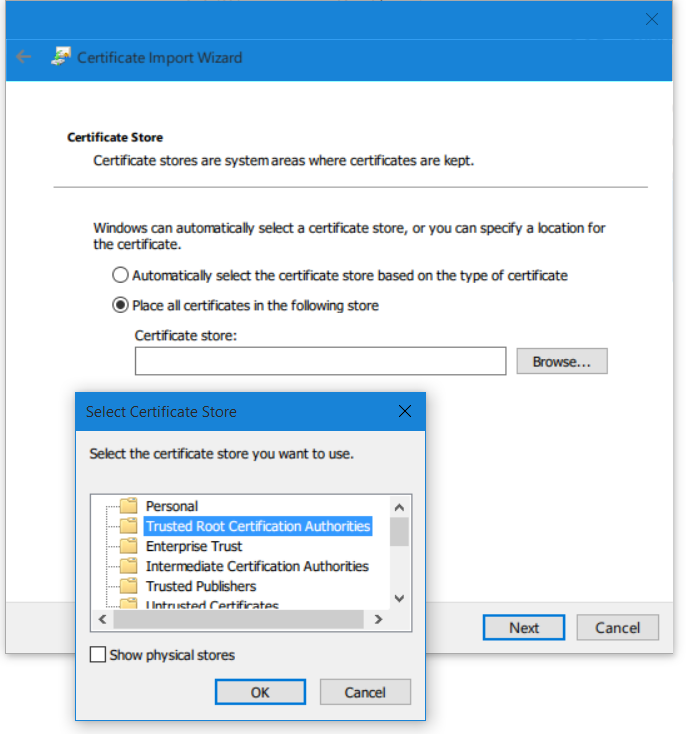 How to bypass Certificate Authority for Local site? Why is malwarebytes.org's SSL certificate from someone else? Why do some unrelated websites (appear to) share certificates? Should I accept a self-signed certificate from my university? In Chrome, how do I see a suspect HTTPS certificate before I visit the site? Why am I getting a certificate error while searching google.com.ph?